I have been a big fan of the Boston Beer Company since I began my beer journey twenty years ago. Though many beer enthusiasts may feel Samuel Adams is too commercial or popular for their taste I personally feel it is still one of the best craft breweries in the country. Yes, it is a larger brewery and quite popular. But does that mean the beer is no longer good? Absolutely not! Boston Beer Company has proven time and time again that it is still one of the top craft brewers in the country. And it’s this commitment to excellence that once again shines through on this year’s summer seasonal releases. 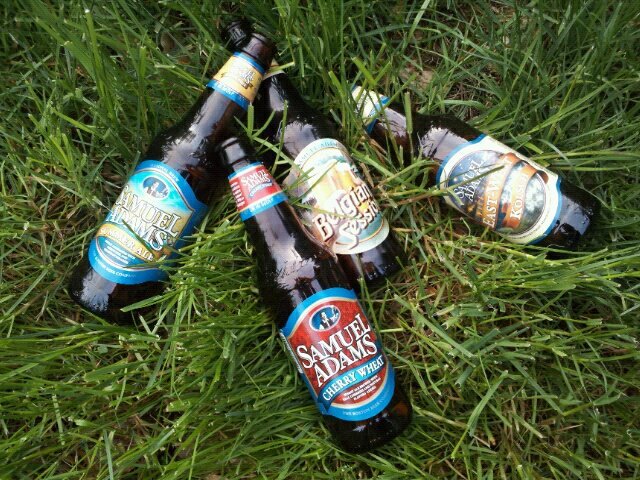 I picked up a case of Samuel Adams’ summer seasonal beers and will definitely go back for more. The pack contains a variety of six different beers (2 of each beer): Belgian Session, Summer Ale, East-West Kölsch, Cherry Wheat, Noble Pils, and of course the flagship Boston Lager. While I love all of them I decided to focus on four of the summer releases. Belgian Session – Strong banana clove and spice aroma. Medium body mouth feel but not heavy. Brewed with Hallertau Mittelfrueh Noble hops and American Ahtanum hops creating notes of flowers, honey and toffee linger and the finish is sweet but not sugary. This is a lovely Belgian-style beer. Summer Ale – Crisp and lightly hopped. Lemon peel and the rare African pepper, Grains of Paradise, are used in this pretty beer. Orange blossoms, honey, and fresh oranges dominate but this is no “chick beer.” The finish is clean and snappy. Light to medium bodied. East-West Kölsch – Jasmine up the wazoo! This floral beauty is brewed with jasmine flowers, cloves, and plenty of hops. Yeast, hoppy and sweet this Kölsch finishes on a spicy note. This is an incredible beer. But, again, definitely not a chick beer! Cherry Wheat – This gem has been an overall favorite of mine for close to twenty years and one of the reasons I look forward to summer! I’m serious!! Brewed with fresh Michigan cherries, the aroma and taste is just incredible. There is no mistaking the fruit but it is true fruit flavor and does not have that weird “fakeness” that one sometimes sees in fruit beers. I have a hard time just drinking one. Most major grocery stores carry the Samuel Adams Summer Variety Pack. If you are one of those folks that feel Samuel Adams is too commercial all I ask is that you give it another shot. Remember, Jim Koch was one of the first “micro-brewers” just starting out. He just happened to produce a great product that became successful. After all, isn’t’ that why anyone starts up their own business? Well said Berger!!!! I still love Sam Adams too!! They sponser an annual home brewers contest and are still very into the quality and fun of making good beer! Thats the part of home brewing I love! The fun and trying to create a good quality brew that you are proud to say you made and share with friends! Keep up the great work!! I love reading your blogs!! I love Boston Beer Company, but I think Cherry Wheat is one of the worst beers I’ve ever drank. I tried it back in 2007 when I was first getting started with craft beer and didn’t like it. Last year after I’d had four years of craft beer experience (approximately 800 different brews) I tried Cherry Wheat again. Yeah, I still hated it. It tastes like cough syrup! On the other hand I love the Boston Lager, Noble Pils, Summer Ale, Octoberfest, Winter Lager, Old Fezziwig and many others. I’m looking forward to trying the Belgian Session. From your review it sounds delicious. Cheers!